Bamako is the capital of Mali, located on the Niger river. With a population of around 1.7 million, it's the largest city in the country and one of the largest in West Africa. 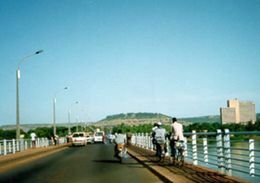 Bamako has been continuously inhabited by humans since prehistoric times. In 1883 it was conquered by French troops, and in 1908 became the capital of French Sudan. The city has only a few paved main roads (goudrons), the rest of the city's roads are unpaved, and get dusty during the dry season (November to May) and muddy during the rainy season, offering breeding grounds to malaria-carrying mosquitoes. The city can be hard to navigate through due to the lack of road signs, the complicated layout of the streets and the one way system in the city. The roads are very crowded both with motor vehicles and motorcycles who appear to fill every available space possible. Traffic police are particularly vigilant and will sometimes appear to enforce very arbitrary traffic rules. They are usually on motorcycles as well so it is unwise to try and out run them in your vehicle as they will easily catch up. Often the best way to navigate around the city is to hire a taxi-motorcycle to lead you to your destination. These are relatively cheap and depending on the distance can be as low as 100 cfa. There is no meter and price is negotiated upfront. Bamako-Sénou Airport is roughly 15km (30–40 minutes) from the city center, with flights from Paris on Air France. Flights to Europe are also offered by Royal Air Maroc, via Casablanca -- the main drawback to this option is that the flight from BKO to Casablanca leaves at 3:35am. Taxi rides should cost about 7000 CFA from the city. Passengers flying Air France should consider pré-enregistrement, or early check-in. This can be done at the Air France office on the day of the flight, between 10AM and 5PM. The office is located at Square Lumumba. Luggage is dropped off and boarding passes issued right then and there, as would happen at the airport - minus the crowds and the hassle! The airport has been undergoing massive renovations in 2009-10. On the plus side, the underwhelming and cramped upstairs waiting area is gone, replaced by a much larger and more modern room. On the downside, many parts remain incomplete. Expect to make your way through worksites. People with difficulty getting around will still find Bamako-Senou challenging, as there are less stairs than before, but a lot more corridors and construction to contend with. Bamako is at the end of the railway line from Dakar in Senegal which used to transport passengers across western Africa. However since a few years back all cross-border traffic have stopped and the only remaing service is a thrice-weekly train from the western city of Kayes and a short commuter service from Koulikoro. There have been several announcements recently of a renewed service between Bamako and Dakar but no trains have yet materialsed. At the Sogoniko bus station you can find busses to other cities such as Segou, Mopti (taking about 10 hours). At the end of each January, Bamako hosts the finish line to the gruelling trans-Sahara rally, the Budapest-Bamako . Hundreds of rally cars and motorcycles arrive in the city on the last Sunday of January. Prices are not fixed, and for many goods bargaining is expected. Beware, sometimes for common items (like food) the first price mentioned is just right. On the market it might be a good idea to first ask a couple of times at different stands before actually buying something. Near the area of Bamako-Coura is the lively artisan market where traders from all over Bamako come to sell silver jewelry, leather, musical instruments and wood carvings. Prices are reasonable but the vendors expect their customers to bargain and enjoy it when they do. Once inside the market the atmosphere is relaxed and pleasant but be careful in the busy streets directly surrounding - it's easy to lose a bag to a thief. ATM's were difficult to find in Bamako, but their presence is growing. BDM banks have ATM's for VISA cards in several branches, and Banque Atlantique used to have ATM's for Maestro/Mastercard, but their license has lapsed, so VISA and possibly VISA electron are now the only options for all Malian ATMs. Love them or hate them, the French have left one decent legacy in West Africa: bread. Fresh delicious baguettes are ubiquitous, and travelers should not be worried about becoming sick because of the bread. That said, mornings beans, fries, and fried plaintains can be found streetside throughout the city. Morning, noon, and night you can find small streetside "cafes" where you can get a VERY fried egg sandwich and some nescafe. Several varieties of fried dough are also easy to stumble upon. Lunch- Rice and sauce is most easy to find, in local restaurants a plate with meat shouldn't cost more than 500, but can range up to 1,500. Evenings you can find attcheke (cassava dish), spaghetti, beans, boiled eggs, and fries relatively easily. Meat eaters will be pleased to learn beef and fish are exceptionally good. Beef kebabs and grilled Capitaine, a freshwater fish from the Niger river, are always a good choice. Chicken are usually left to fend for themselves, and tend to be on the scrawny side, especially compared to North-American chicken. Although the situation is improving, you might want to avoid disappointment and just give chicken a miss while in Bamako. To avoid food borne illness, stay away as much as possible from fresh vegetables, and make sure your food is piping hot before eating it. You can eat like the locals for a few hundred CFA a day, or shop in one of the western-style supermarkets. There is one main market, in the centre of town, and several smaller markets in Bamako. Supermarket-style stores are generally run by Lebanese businessmen. La Fourmi A two story grocery store, the second floor contains house hold supplies. The butchers will cut the meat to order. The store is open from 7:30 am -1:00 pm and from 3:30 pm - 8:00pm, Monday - Saturday. Sundays 8:30 am -12:30 pm. Azar The store is open from 7:30 am -1:00 pm and from 3:30 pm - 8:00pm, Monday - Saturday. Sundays 8:30 am -12:30 pm. Supermarket Le Miniprix It is actually the best one with the best service and with the lowest prices. They have a very clean store and are open from 7:30am to 10:30pm. They also accept US/Canadian Dollars and Euro. These stores will carry Western or Middle-Eastern goods, including cold cuts, fruit and vegetable, and dairy products including fresh milk and yogurt. Prices are generally higher than in Europe or the US, and choice more limited in a way reminiscent of a North-American convenience store. There are many restaurants where you can get nice omelette sandwiches for about 250 CFA. Many street vendors sell bread, rice, fries, salad, grilled meat; however, use precautions while eating on the street. Assalam - ACI 2000 between the obelisk round point and Place Can. Lebanese- good shawarmas, hummus, brochettes- varied menu. Pleasant staff. Bamako has many Lebanese and Chinese restaurants. Bla Bla is where Bamako's uppercrust go to relax and have a (expensive) cocktail or bottle of champagne. With a small but delicious African menu, a wide range of cocktails, and cold draft beer - it is one of the most popular restaurants to see and be seen. An entree here is around $15 US. Also this place frequently has art exhibitions for local artists. Le Terrace next door to the Bla Bla is a very large bar/lounge on top of a night club. Very good atmosphere and salsa music, dancing. Good pizzas and other fare. Le Relax is a popular Lebanese hangout in Hippodrome with quick food and free wi-fi access. Pizzas, shawarmas, and hummus are the stars in this menu. Broadway is a Western style restaurant which is pretty much the only place you can find a "real" hamburger with "real" cheese. Also on the menu are breakfast burittos, chicken wings, and shakes. Great if you are missing the comforts of home. Burgers only run $4 without fries but expect to pay up to $12 for a full entree. San Toro is a restaurant serving traditional Malian food and drink - no alcohol, but many ginger, tamrind and seasonal fruit based drinks. There is always live acoustic music there and the ambiance is very relaxed. Da Guido just after the Bla Bla Road becomes dirt, is a real Italian restaurant run by real Italians. Their oven fired pizzas are the best in Bamako and they also serve up hefty portions of delicious pasta. Expensive wine flows freely here. Walking into this place you will think you just walked into an Italian restaurant in Brookly with the Roman wall murals and brick floors. A good pizza will run you about $15 US. The Evasion Jazz Club can be pretty cool on Fridays and Saturdays. The Hippo d'Or (close to Hippodrome) is also a nice place for enjoying non-stop live music on Fridays and, even more, on Saturdays. There is a big Casino near the Hotel L'Amitie. Ibiza, Blyblos (under renovation as of August 2010) and Terrace are still the hippest places to dance and drink. For some less seedy drinking establishments, try No Stress & Jet Set (formerly Privledge), which both have pool tables as well. Bla Bla and its twin in Badalabougou are known to get pumping on weekends. Crazy Horse has some good food and is well priced. In Bamako you have a high chance of encountering the police. You should always at least carry a copy of your passport and visa. It is often not sufficient to just show your driving license and this might lead to a ride to the police office - if you're not prepared to bribe your way out. Notice that the police often stops taxis. If the price of the 'ticket' seems high (more than, say, 5,000 cfa for a minor offense), ask to go to the police station. There you can get an official receipt which shows the true price of the offense. Many locals consider it a moral issue to pay proper fines rather than grease the pockets of corrupt police. If you go gradually (doni doni) you'll be able to drink Bamako's quite chemically tasting tap water. You shouldn't drink the unmarked sachets with water or syrupped water as long as you don't drink tap water -- though the branded sachets of mineral water are fine (50CFA). Or you can avoid any hassles and drink bottled water. If you're sticking around town for a while, try buying bottled water by the case. The price will drop from about 1500-1800 CFA to 600-700 CFA per 1,5 litre bottle. Clinique Pasteur is a more expensive tubab clinique, is fairly clean, and is within close proximity to the US Embassy in ACI 2000 area of Bamako. You first might want to consult a cheaper normal heath center like Clinique Farako in Hamdallaye, or the Centre Diagnostique (Dr. Catherine Cisse) near the old Pont de Martys. Even then, double check all recommendations online and with a doctor abroad before embarking on any treatment plan or surgery. Sibi is a town at a one hour drive (with a 4 wheel drive vehicle) from Bamako. It has very nice scenery, rocks to climb, and the Saturday market. This page was last edited on 15 January 2018, at 09:32.